Who would like to start their brand new week with a history lesson? Ummmm……….me? Not so much, but if it’s fashion history, count me in! Welcome to Girls Want Pearls! 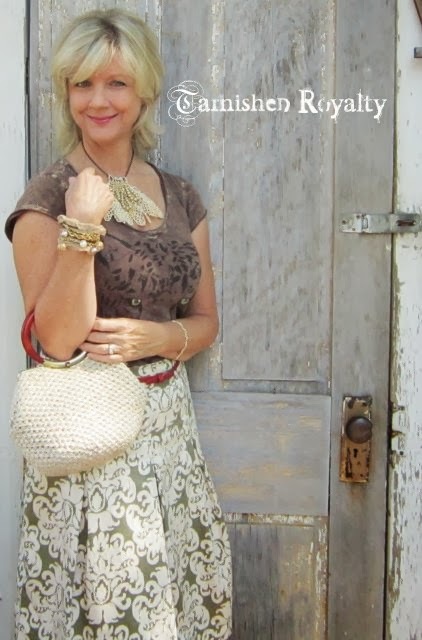 Every Monday for a year I am posting about pearls, things you can do with them in your wardrobe and decor, how-tos, and interesting tidbits from history and the Bible. 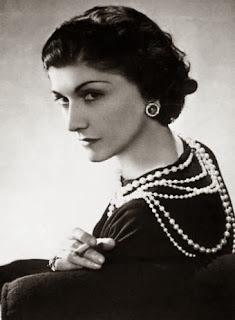 Any study of the history of pearls in fashion will eventually lead to one iconic woman, Coco Chanel. In researching and preparing this post I discovered so many interesting aspects of this woman. 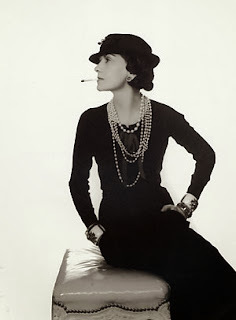 I could go on and on and on, but in an effort to keep my readers interested, I will try to focus on that which relates to fashion and pearls. 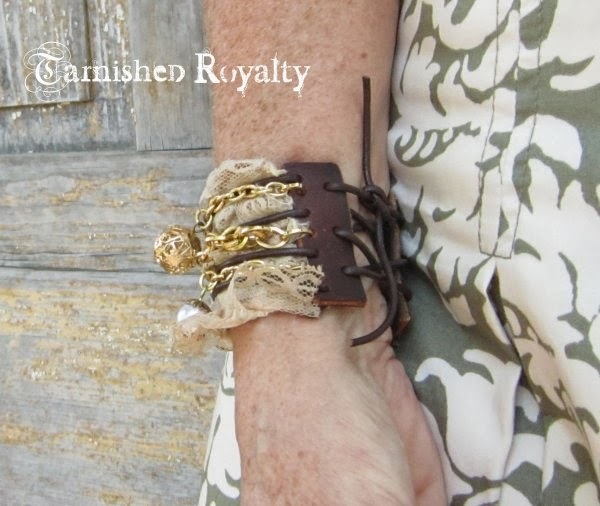 She made costume jewelry appeal to the masses with her own jewelry line. 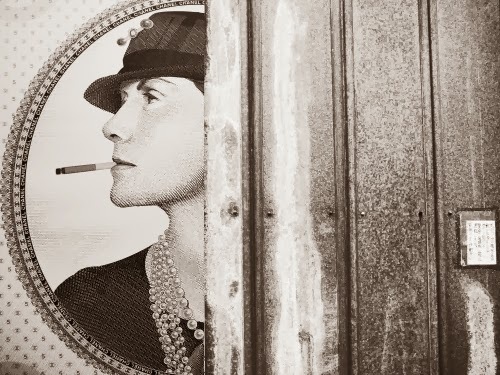 Though she had been given many extravagant, expensive jewels by men friends, she wasn’t a snob. 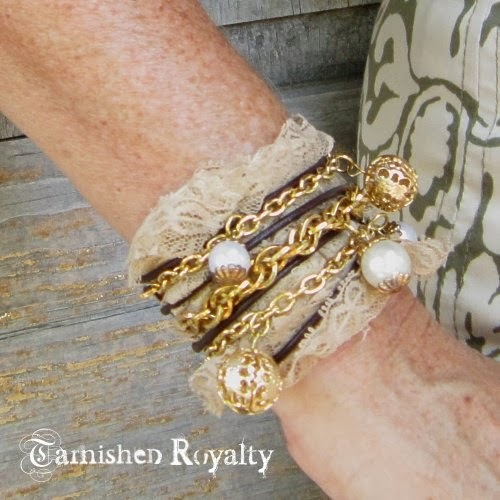 Her layered-on style with piles of pearls became a popular trend. HA! Don’t you love it? 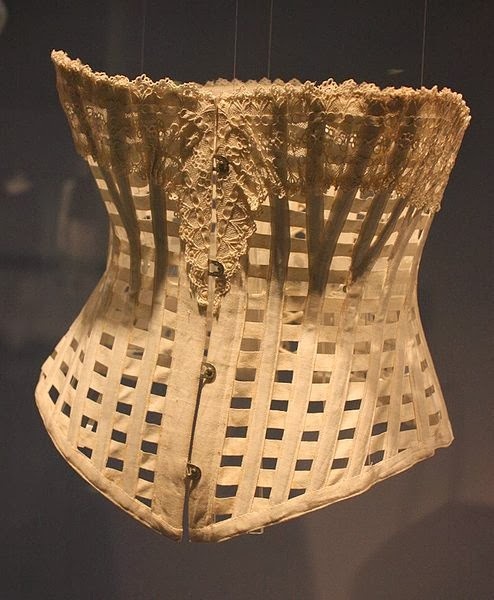 Thankfully, she is thought responsible for looking at the corset, a staple in every fashionable woman’s closet at the time, as something the fashion world could do without. Yikes! Who’s glad we don’t have to squeeze into one of these? 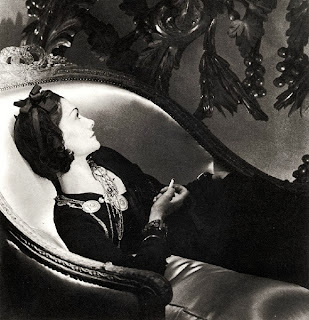 Coco Chanel has been gone for more than 40 years, but her legacy lives on. It’s a rainy Saturday here and I love it. Candles glowing, windows open and Adele singing, ahhh so inspiring! I don’t typically post on Saturday but I got behind this week fighting off a sinus infection and now I’m raring to go so I decided to share an outfit that I showed a peek of in an earlier post. Sorry for the cheesy smile! 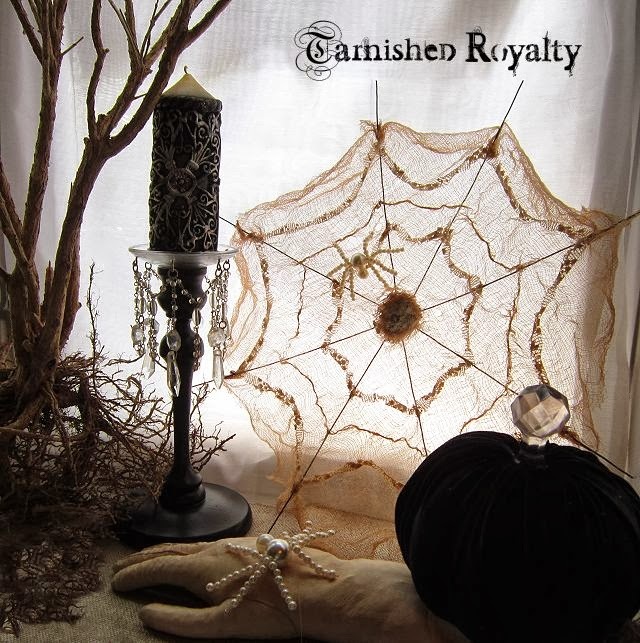 Well here it is, as promised though a day late, my spider web tutorial. 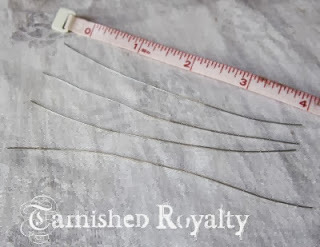 Prep: Cut 8 8″ lengths of sturdy wire. 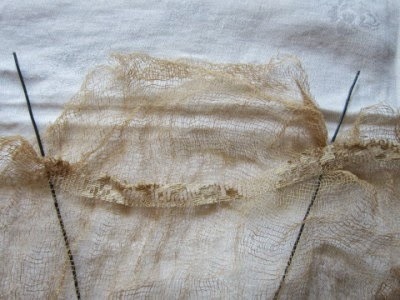 Cut a 14″ x 14″ square of cheesecloth. Cut two 1 3/4 inch circles of cheesecloth and 2 of lace. 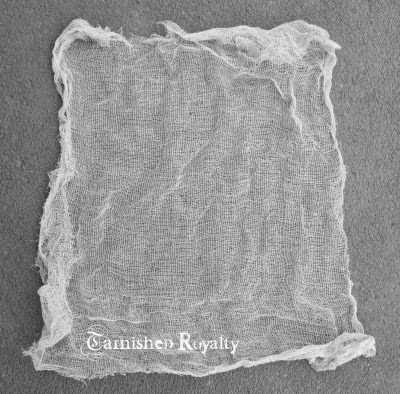 Dye cheesecloth if desired in your color choice. It comes in white. I tea-dyed mine. Cut a disc from styrofoam approx. 1 1/2 inch diameter by 1/4 inch thick. 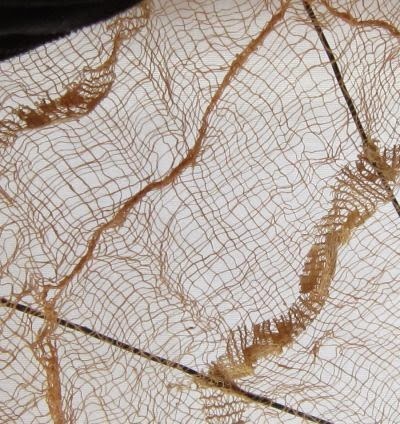 Cut two strips of lace approx. 1/2 inch wide, one approx. 50″ in length, one approx. 35″ in length. The edges should have a crooked finish rather than a straight edge. Start at any point for the first piece, then place the second piece opposite the first (as in the twelve and six on a clock). Place the third piece as in the 3 on a clock and the fourth piece at the 9 position on a clock. Continue with piece five through eight placing at opposite positions in the same manner. 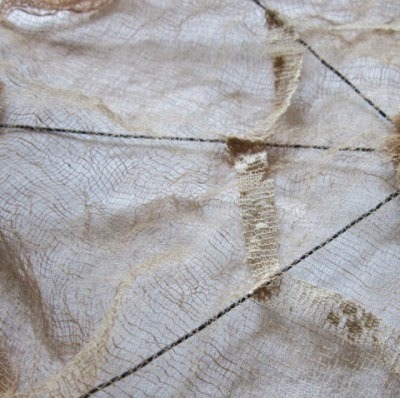 Place a dot of glue where the wire meets the disc at each opening. 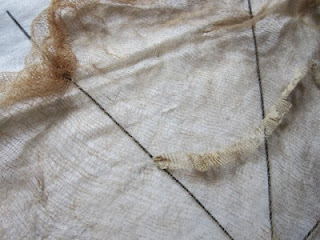 Lay the cheesecloth centered over the wire structure. 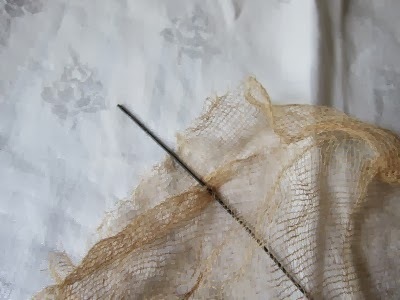 Dot cheesecloth with glue at the center and at approx. 2 inches from the end of each wire. Allow to dry. Starting with the shorter, inside piece first, glue one end of the lace to a point on one wire approx. 3 inches out from center of disk. Swag lace downward and glue to next wire. Fold lace against itself and downward before swagging to third wire. Glue and continue until you end up at beginning point. 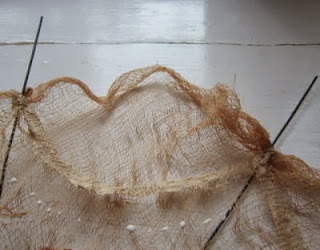 Glue and trim excess. Pinch connecting points to secure and adjust swags. 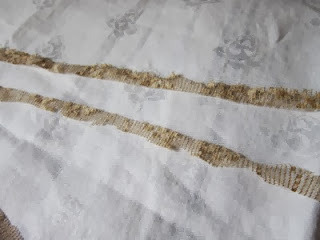 Glue the longer, outside piece in the same manner, starting approx. 6 inches out from center of disk. Dot glue in swag pattern as shown below, all around the web approx. 4 inches out from center of disk. 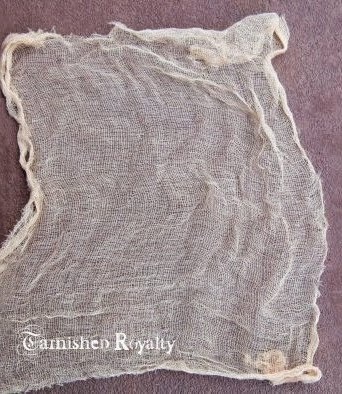 Allow to become almost dry, then from the other side of the cheesecloth pinch together and slightly roll between fingers, forming the desired swag. 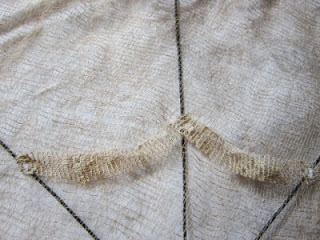 Keep a damp cloth handy to wipe glue from your fingers as you work. 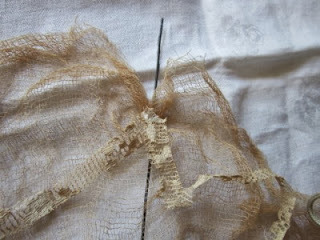 If your wrinkle or roll becomes mis-shapen you can gently pull it apart as needed and re-roll. 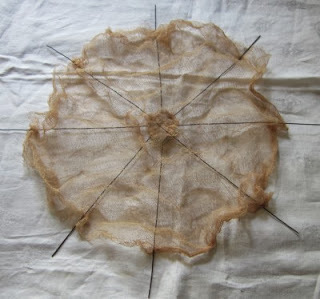 Glue cheesecloth circles to front and back of styrofoam, followed by lace circles. You can find the how-to on making this sweet pearl spider here. 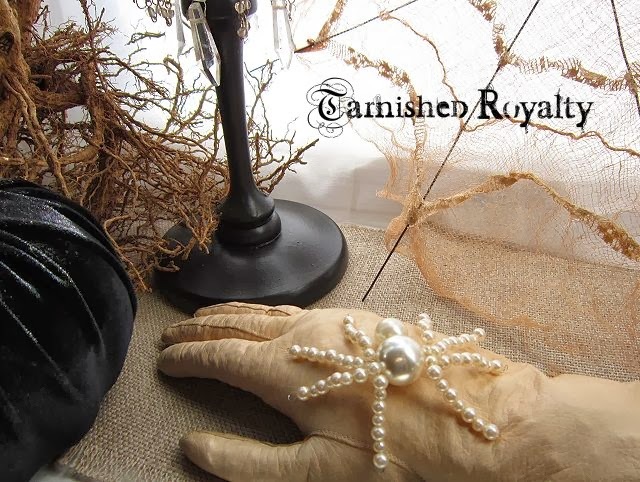 Girls Want Pearls and they want pearly spiders too?! 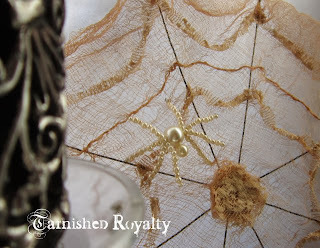 Now for the how-to: I made the spiders using just two materials: wire and pearls. So easy!! Here’s how I did it. Start with four pieces of wire, approx. 4 inches long for the larger spider, or 3 inches for the smaller one. The wire is a fine gauge, small enough to fit through the hole of the pearl when twisted together. Twist them in the center, four or five times to keep them together. 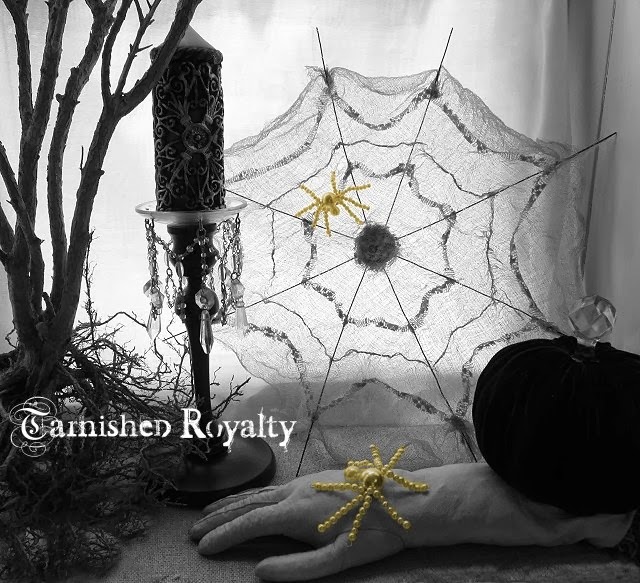 Thread the twisted wire through the spider’s body, a pearl approx. 3/4 inch for the larger spider, and approx. 1/2 inch for the smaller spider. 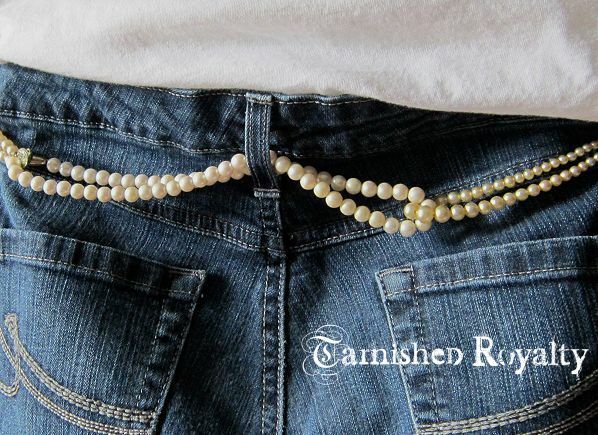 Then thread your pearls onto each leg. 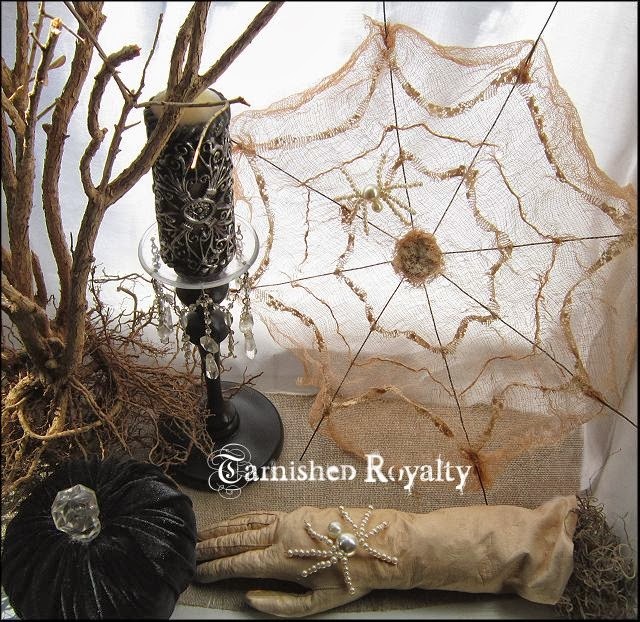 I used 2 alternating sizes of pearls for the legs of each spider, approx. 6mm and 8mm for the larger spider and 4mm and 6mm for the smaller, but you could really use whatever size you want. Curl the wire around at the end with a pair of needle nose pliers to hold the pearls in place. Spread out the spiders legs as you go, putting six of them towards the front and aiming one pair towards the rear. Bend each leg up at the first pearl closest to the spider’s body, then downward after the second pearl closest to his body. Bend the pearl at the end of each leg upward slightly. Now for the head and you’re almost done. 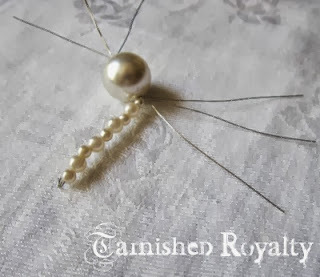 Use a pearl slightly smaller than the body, I used approx. 1/2 inch for the larger spider, and 3/8 inch for the smaller one. Just glue the head to the body using E-6000 or your fave glue. I created the spider web too. You can see the tutorial for that here. It takes more time but it’s not too difficult. Next week’s Girls Want Pearls hint: Hot Coco Anyone? Gosh, I haven’t been able to post my outfit post this week, so I’m going to make use of a girlfriend-time photo taken yesterday to share my outfit (and theirs) with you. Good friends Claudia and Kelly and I met up for coffee before a little shopping. 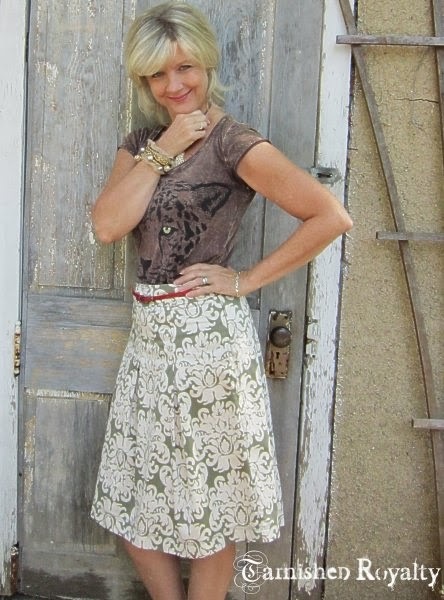 This was my first print mixing outfit. A pretty “tame” start, don’t you think? I’ll show a few close-ups of details in a later post. I love that our outfits coordinate (unplanned). 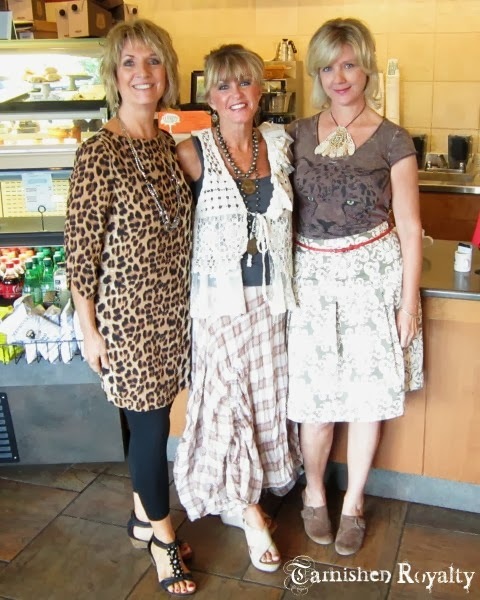 Claudia and I both have a leopard thing going on and Kelly and I both have some crochet lace. Here’s to great friends and a great weekend to all! Ahhhh, it’s finally starting to feel like fall here in the midwest. We rolled out the firepit and had a campfire this weekend and it felt good! Didn’t have any marshmallows to roast though :(. 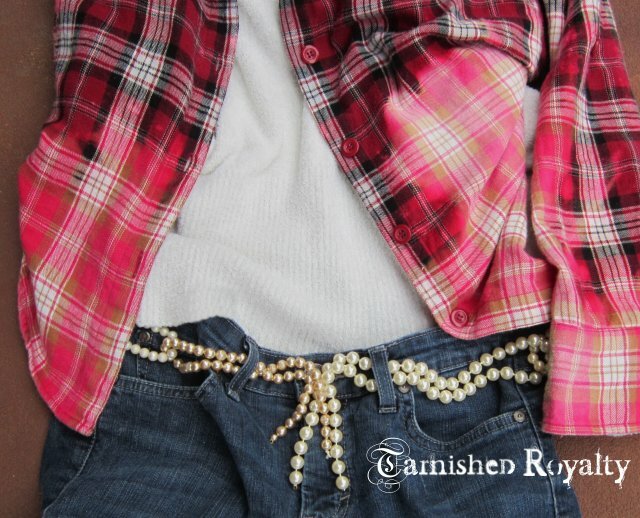 So last Monday the hint for this week’s Girls Want Pearls was It’s a Cinch…did you guess what it was? Okay, enough word play let’s have some fun with pearls. 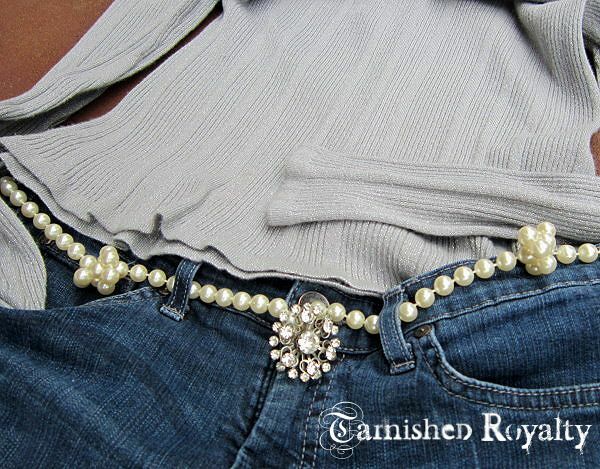 Pull out those strands of pearls, long and short for an easy but sassy new belt. There are several ways one could go about creating this type of look and I will show you two. The first look uses approximately 3 necklaces and 2 open strands, depending on the lengths that you have on hand or purchase. 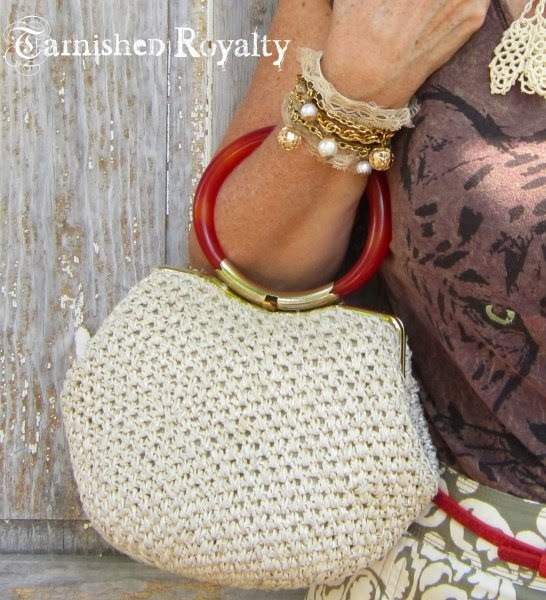 I’m very much a mix and match kind of girl so I like to use different sizes and shades of pearls. Start by hooking the 3 necklaces together as shown in photo #2 . For the front you’ll use the 2 open strands, looping one through the necklace on one side and one through the necklace on the other side (see photo #1). 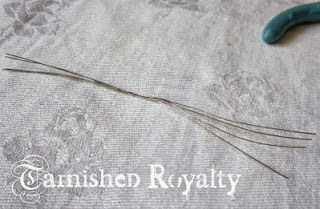 Gather the 4 tails in the center at the fly and wrap a clear hair band around to form a tassel. Voila! 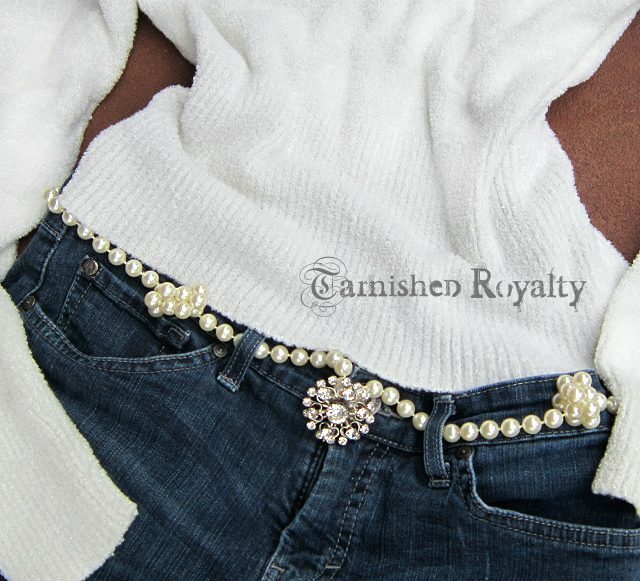 Pearly belt with instant sass factor! 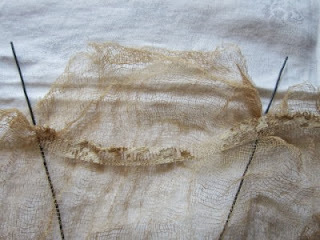 The second look uses one or two long single strands and a brooch. The length will be determined by your waist/hip size. 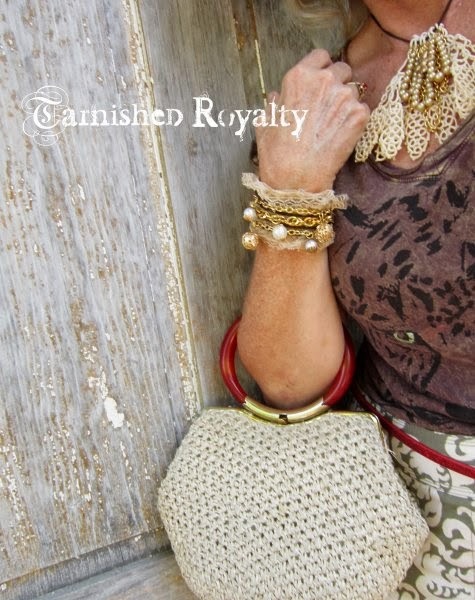 Start by placing knots in your pearls at intervals of your choosing. I placed mine roughly between each pair of belt loops. Thread strand through belt loops so that the beginning and ending of the strand meet at the fly. Connect the pearl at each end with a clear hair band. Run the pin on your brooch through the elastic band and clip closed. 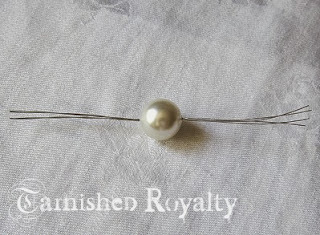 If your pearl strand is not long enough, you can use two strands. Make the two strands meet in the back, wrap with a clear hair band to form a 2-tail tassel (as in the first look), OR secure with a band and brooch. Do the same in the front at the fly. Hopefully I haven’t made this confusing. Feel free to ask any questions!! I’m having a lot of fun with this 52 week series and hope you are enjoying it too! I’ll be alternating the posts between fashion and décor with some facts and thoughts thrown in.